The Mosquitto MQTT broker can be configured to require client authentication using a valid username and password before a connection is permitted. However using username and password authentication does provide an easy way of restricting access to a broker. Note: The username used for authentication can also used in restricting access to topics. In this tutorial we look at how to configure username and password restrictions on the mosquitto broker, and look how it works by looking at some connection examples using simple Python test scripts. All forms of restrictions i.e. client id, username/password, topic etc are implemented on the MQTT broker. Once implemented on the broker it is up to the client to comply with these restrictions in order to connect, subscribe and publish. Edit the mosquitto.conf file to force password use. To create a password file you need to use the mosquitto_passwd utility that comes with the client tools when installing the mosquitto broker. 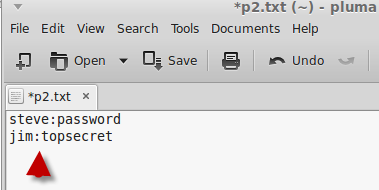 Create a simple text file and enter the username and passwords, one for each line, with the username and password separated by a colon as shown below. Close the file in the text editor. The passwords file is now ready to use. Note you need to enter a username for this to work. This adds the user to the password file. You will be prompted to enter a password for the user. Be careful as the password isn’t echoed and it doesn’t look like it is being accepted but it is. to add additional users to the file. Important Note: The mosquitto_passwd utility did not work on my Windows XP installation, and I had to use the utility on my Linux installation. 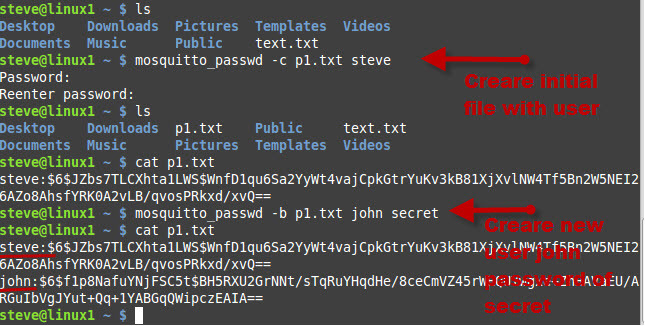 You will need to copy the password file into the etc\mosquitto folder ( linux ) or the mosquitto folder(windows) and then edit the mosquiito.conf file to use it. The two changes you normally make in the mosquiito.conf file are to set allow anonymous to false and to set the password_file path. 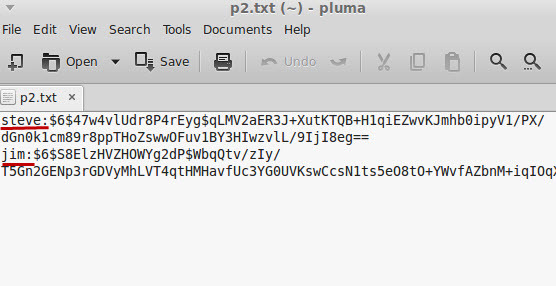 An Example password file called pwfile.example is provided with the installation. All three users have a password of password. If you make a change to the configuration files including the password file you can restart the mosquitto broker. To connect to a broker that implements username/password restrictions you need to use the helper method username_pw_set() of the Paho client. This you must call before establishing the connection. If you try to connect to a broker without the correct authentications details the connection will be rejected. To detect this you will need to examine the on_connect callback. If you examine the documentation for the on_connect callback method you will see that it accepts 4 parameters. The rc parameter is the return code and should be 0 for a good connection. A return code of 5 indicates an authentication error. 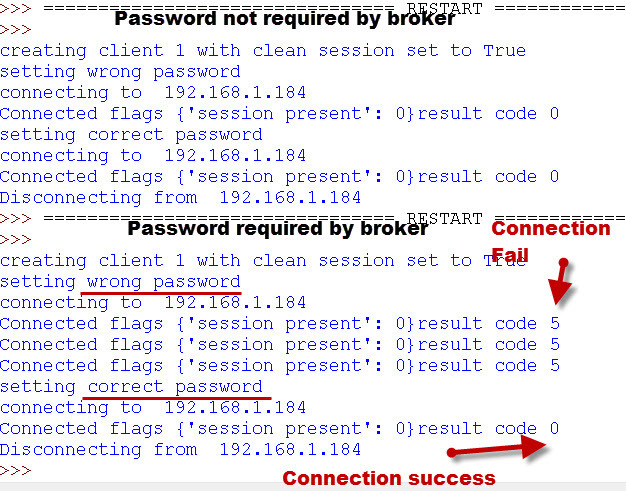 The screenshots below show the results of connecting a client to a broker with incorrect and correct passwords. Example 1– In the first attempt the broker isn’t configured to require passwords, and so it simply ignores the wrong password. Example 2– In the second connection attempt the broker is configured to require a username and password, and rejects the connection attempt with the bad password. For username/password control to work correctly then there are two settings that need to be configured on the broker. However the Password File is used (if present) ,even if the broker is set to allow_anonymous access. The follow table shows how the anonymous access setting and the password file settings affect client access. Note1: If a password file is specified then if the client sends a username/password then it must be valid other wise an authentication error is returned. If it doesn’t send one then none is required and a normal connection results. Note 2: The client must send a Username and password, but it is not checked. If the client doesn’t send a username/password then and authentication error code is generated. In this example we connect to a broker that allows anonymous access but is configured to use the password file. You can see that if the client supplies a username/password then it is checked. 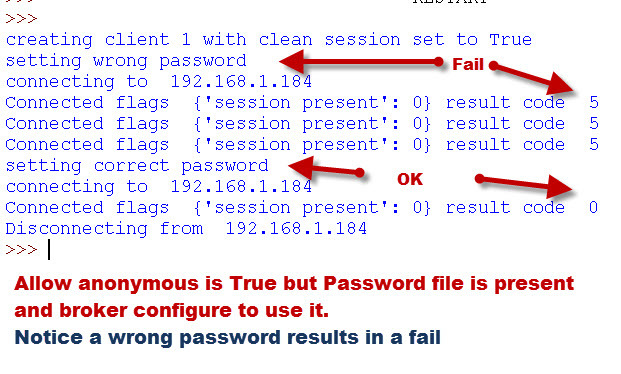 In this example we connect to a broker that allows anonymous access and is not configured to use the password file. You can see that if the client supplies a username and password then it works even if they are invalid.However if it doesn’t supply the username/password then the connection fails.. I have created a video that covers the main point above.You can find it here. Q- Can I use the same username and password on multiple clients? Q- Is the username and password encrypted? Username and password authentication is common on all computer systems and the Mosquitto MQTT broker supports this authentication mechanism. To use Password authentication you need to configure the MQTT broker to require it. The username and password are sent in clear text, and you will need to use TLS to secure it. Here is the python code that I used to create these examples. Can we use databases for the authentication and is that necessary to restart config files after adding new users ? Yes there are plugin options but you need to write the code. I haven’t tried that or seen it done. When using the text file for passwords you need to get the broker to reread it after any changes. I was wondering if I run the kill-HUP PID command will it stop the broker from receiving messages or only reloads the config file? It doesn’t really impact current implementations as they don’t use it and existing authentication mechanisms have been retained. I don’t think it will simplify authentication as it is pretty simple as it stands. Excellent article! Thanks a lot, Steve!!! Congratulations! Hi! I’m reading several of your guides regarding MQTT, and I appreciate how thorough your explanation is. Would it make sense to have a separate username and password for all clients? I’m starting out with MQTT and ESP8266, projects involving temp/humidity shown on epaper, plant monitors etc. I’m worried about safety with WiFi transmission, TLS doesn’t seem to be that common with MQTT and ESP8266, so I’m a bit unsure how I should proceed. I guess I’ll skip TLS while prototyping, as I’m not using MQTT at all at this time anyways. It will obviously depend on what the devices are used for as to whether or not you use username/password. I like to keep things simple and so would go for no username password if possible and only a single password for all devices as the next best option. A password for each device would be difficult to manage if you had lots of them. As for TLS then again if your data isn’t sensitive then why encrypt? I would expect most local networks wouldn’t use encryption. However for control data I would employ some form of security even on local networks. Encryption would mainly be done on the connection to the Internet. I think on local networks you will see topic restrictions by client id as a common option for basic security. I am trying to publish a message to IBM cloud, and use on_connect to check the connection. sometimes 2-3 of that same line. I don’t get any case where rc parameter returns 0. Can you give me an idea where i did wrong? looks like my authentication info is not correct? update : MQTT Helper is now working, i needed to change port 1883 to 443. So the authentication was not the problem. Should I use port 443 in paho as well? Also how do i use kill-HUP in windows? Now assume in my app,user register in app and i need add this user in password file,how do it? Make script and use it for add user in file and restart broker? If i restart broker,are they losing all conenction? Sorry but I’ve never tried it but would expect it to work. The fiel size seems large to me as there isn’t much in it. Just to clarify, if you are running in Windows as a service, Mosquitto will look for mosquitto.conf in its executable’s folder. If there are any errors in the conf file you will get a message that the service started then stopped. If there are any errors in the conf file then the console will report that error and line number. Fix, rinse and repeat. Once it runs from the command line then you can run as a service without further issues. how can I use the given password which I`ve protect in my passwordfile.txt in my python script? I’ ve rewrite the config file and after that I`ve reboot the Raspberry Pi. I’ m using the command username_pw_set(username=”roger”,password=”password”) in my script but without password I get an error when I’ m running the script. I think the password doesn’ t be use of passwordfile.txt. Have you created your own password file? The command you are using is correct but you need to use it before you connect to the broker. Are you trying to use the command without the password? If you are then don’t configure a passwords file in the mosquitto.conf file and allow anonymous access. the process nor affect currently connected users, this is a normal Linux behavior. To me the need to kill the process to provision a new user is non sense…you disrupt the service of all other users to provision a new one !??! Any idea or workaround to overcame this big limitation ? I have mosquitto installed on linux, I have created PWD file and added few user/pwd with proper command but in order to make it effective in need to stop / start mosquitto process ! Is this normal? Is there any way to make mosquitto load the passwordfile run-time without any re-start ? 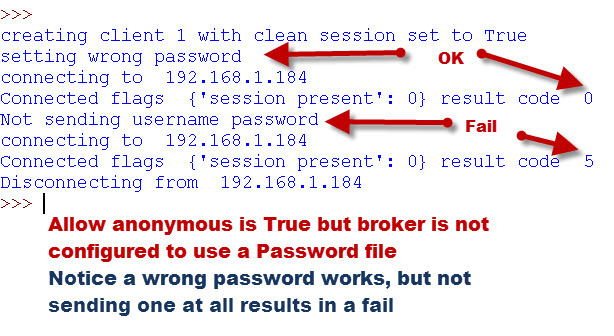 Hi, i have encountered a problem when i try to connect to my broker after modified the configuration file (the setting for password_file and allow_anonymous). After i type in the command mosquitto -c c:\mosquitto\mosquitto.conf (this is my conf file path), the broker didn’t start. But if i commented the setting i modified as stated above, the broker can start and running without any issue. Do you have any idea what caused this problem? Oh never mind, it’s just that the password file created with the command isn’t .txt file and i forgot to change the extension type. Do we really have to write Paho Python client code in order to implement the user name/password every time a client connect to the broker? Can we just do configuration on the command prompt(i’m using windows to do all this tasks) and still get the same result? I don’t have any knowledge regarding python code so it might be difficult to me to write the client code. You can use the mosquitto_pub client that comes with the install on windows. I have a beginners tutorial here http://www.steves-internet-guide.com/mosquitto_pub-sub-clients/. The only problem is that is is more difficult to automate than using python scripts. How send username and password to connect a mosquitto? What client software are you using? can I use this auth-plugin (https://github.com/jpmens/mosquitto-auth-plug) in the windows? can you provide any article about “role-based access control” ? can we use MYSQL database (or any database) for authentication and authorization in the broker side? You can use other authentication methods but I haven’t looked into it yet. Here is a plugin https://github.com/jpmens/mosquitto-auth-plug that should do it but it looks quite involved as regards setup. I’ll put it on my todo list and have a go. I haven’t seen anything on role passed authentication but expect it will be implelented at some time. I corrected the problems. I didnt understand what was the problem, because everything was exacthly same as you. finally after some re-install, i could run it correctly. How can I implement an Access control list (ACL) in this local mosquito broker? and it worked perfectly with chrome LENS extension. then I wanted to add username/password authentication.here was where I saw your site. and followed it step by step. But I don’t know why username/password authentication does not work at all and client can connect with wrong username/password! 1. I’m using chrome LENS extension to connect to this local mosquito. 2. I used the mosquitto folder that you add in “http://www.steves-internet-guide.com/install-mosquitto-broker” also, but did not work username/password auth again. mosquitto -c c:\mosquitto\mosquitto.conf ( that is the location of my config file your will be different). You need to disable anonymous access and set up a password file in the config file. I can enable username/password authentication now. so that my chrome LENS can not connect to the local mosquitto. when I changed mosquitto.conf file, do I have to restart mosquitto service from services panel in the windows 10? then I removed my changes in mosquitto.conf file (place # againfor allow_anonymous and password_file) , and tried to restart the mosquitto service again and it started successfully. 1. do we need to restart manually mosquitto service? 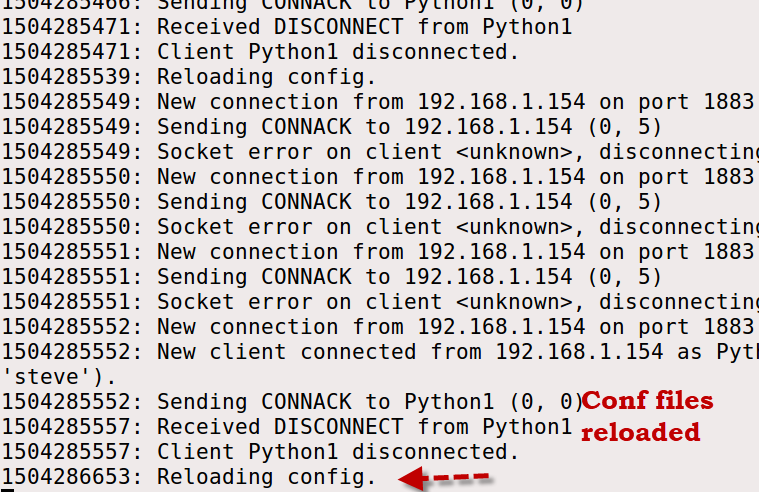 2. why restarting mosquitto service after modifying “mosquitto.conf” gives me the above error? When you make any changes to the conf file the mosquitto broker needs to be restarted. Because Windows has installed Mosquitto as a service you will need to stop and start this service. This is OK in a production environment but for testing I disable the mosquitto service and start it manually from the command prompt. Doing it this way I can also see the console log and use any conf file I want. What about authentificating and registering users from client (eemple ios swift app), hat is the best solution, the mosquitto broker is hosted on a memory constrained debian 8 vps. By the way, do you have any idea on how to control the mosquitto broker , for example when it hangs…? So, when mosquitto broker hangs, I want to somehow re-start it or do something so that it will be functional again. That would be an operating system task as the broker will be running as a service. I haven’t looked at that aspect yet. Nice write up! Thanks, Steve!